Tote measures approximately 11" wide x 8" high. 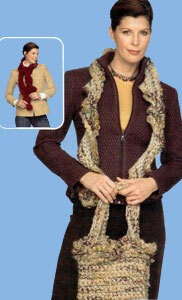 Scarf measures approximately 4 1/2" wide x 54" long. RED HEART® "Light & Lofty®": 2 Skeins No. 9617 Pheasant (or 9376 Wine) CA. RED HEART® "Super Saver®": 2 Skeins No. 330 Linen (or 376 Burgundy) CB. Crochet Hook: 11.5mm [US P-16]. GAUGE: 8 sts = 4"; 7 rows = 4" in sc. CHECK YOUR GAUGE. Use any size hook to obtain the gauge given. NOTE: Use 1 Strand CA and 2 strands CB held together as one unless otherwise specified. FRONT AND BACK (Alike): With 1 strand CA and 2 strands CB, ch 19. Row 1 (Right Side): Sc in 2nd ch from hook and in each ch across; turn - 18 sts. Rows 3-14: Rep Row 2. Fasten off. FINISHING: Sew sides and bottom. Edging-Rnd 1: With right side facing, attach one strand CA at a seam; ch 3, dc in each sc around; join with a sl st in top of ch-3. Rnd 2: * Ch 3, sl st around post of next dc; rep from * around; join in first ch of ch-3. Rnds 3 and 4: Rep Rows 1 and 2. Rnd 5: Sl st in top of dc of Row 3, ch 5, * sl st in next dc, ch 5; rep from * around; join. Fasten off. Straps (Make 2): With one strand CA and two strands CB held together, ch 41. Rnd 1: 3 Sc in 2nd ch from hook, sc in each ch across to last ch, 3 sc in last ch, TURN to work along opposite side of foundation ch, sc in each sc across; join. Fasten off. Weave in ends. Stitch straps in place as shown. With 2 Strands of CB, ch 102. Rnd 1: 2 Sc in 2nd ch from hook, sc in each ch across to last ch, (2 sc, ch 2, 2 sc) all in last ch, working on opposite side of foundation ch, sc in each ch across to first ch; 2 sc in first ch, ch 2; join with a sl st in first sc. Rnd 2: Ch 3, working in BACK LOOP ONLY, dc in each sc around, working (dc, [ch 1, dc] twice) in each end ch-2 sp; join. Cut CB. Rnd 3: With right side facing, attach CA around the post of any dc; ch 3, * sl st around the post of the next dc, ch 3; rep from * around; join in first ch of ch-3. Rnd 4: Sl st in top of dc, ch 3, * sl st in next dc, ch 3; rep from * around; join. Fasten off. Weave in ends. ABBREVIATIONS: CA = Color A; CB = Color B; ch = chain; dc = double crochet; lp(s) = loop(s); mm = millimeters; pat = pattern; rep = repeat; sc = single crochet; sl = slip; st(s) = stitch (es), * or ** = repeat whatever follows the * or ** as indicated: [ ] = work directions in brackets the number of times specified.